I don't know the port used by your application. It depends on your code. In this example, I will assume the port is 3000. If you have a result, you need to kill the process (kill <pid>). You should check if pm2 list returns 0 process. In addition, when you do a pm2 stopAll, the socket is not released. Don't forget to do a pm2 kill to be sure the daemon is killed. 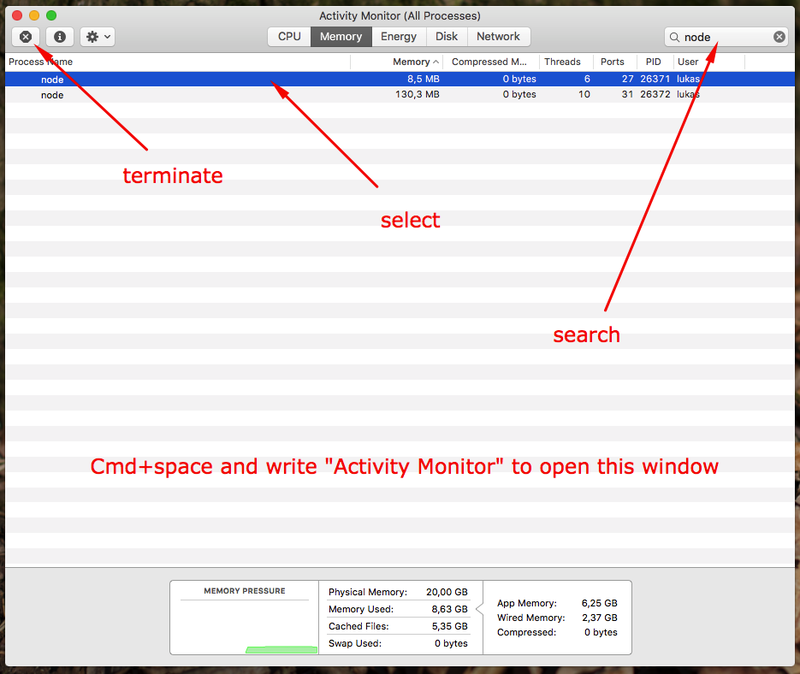 Cmd+Space -> enter: Activity Monitor -> find your app and terminate it. Not the answer you're looking for? Browse other questions tagged node.js mongodb deployment express cluster-computing or ask your own question. Error handling principles for Node.js + Express.js applications? How do I deploy Node.js applications as a single executable file? NodeJS: Error listen EADDRINUSE :::3000?